1-1/8x 1-1/2" [miniature in size only] are these two intersecting heart-ish Arkansas dark blue phantom crystals - what amplified energy these feel! 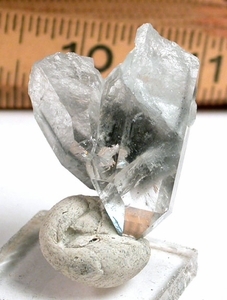 The larger point is an in-line hera, or self-healed crystal, with fleabites and a large channel face. The smaller crystal shows six facets by reason of an uncommon 7h face. Each is very clear with small vibrant rainbows in good contrast to the dark shale, and each base is in regrowth. From Montgomery County, Arkansas to you.